Date Night (n.): 1. (Without Kids) Hit the town with your spouse or significant other. Start with happy hour drinks. Hit up a cool new spot for dinner. Maybe grab ice cream at that trendy new spot with the punny name (you know the one) and finally catch that Indie rock show that’s been popping up on your Spotify list. No big deal that you get home at 2AM because you can sleep in until your brunch reservations the next day. 2. (With Kids) Order cheap Chinese food at 6:30pm and rent The Big Short. Make it through most of it. That’s what Bets and I did last Friday and it was pretty marvelous. The movie was really awesome (I loved it) and I have a soft spot for cheap Chinese food. Mostly, I want it to be spicy and plentiful. 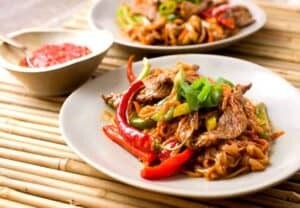 When I’m feeling slightly more ambitious, this Szechuan Beef Noodle recipe is the kind of Chinese dish I like to make. You can make it as spicy or mild as you like and load it up with fresh veggies. I think this recipe is great for a date night actually and makes two very hearty servings. If you double the recipe, I would maybe cook the beef in two batches so you don’t overcook it. 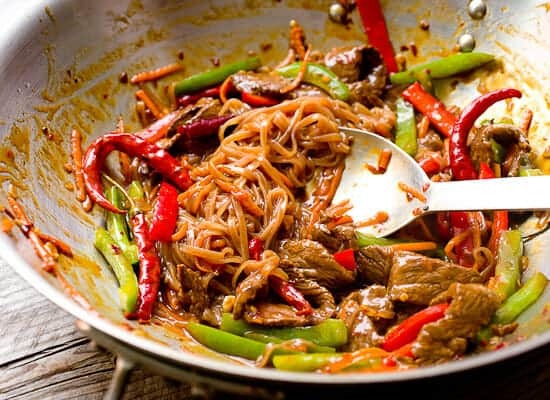 This spicy recipe is a riff on the classic Chinese dish. Same flavors, but turned into more of a noodle bowl situation. 1) Slice steak thin. 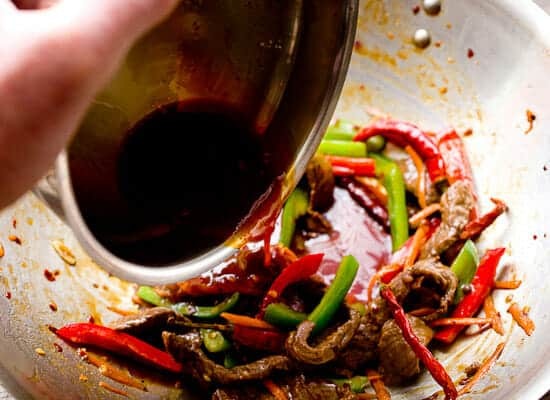 In a medium bowl, whisk together soy sauce, rice wine vinegar, corn starch, and red pepper flakes. Add steak and marinate while you prepare other ingredients. Slice garlic and peppers, grate carrot, and whisk together sauce. 2) Cook noodles according to package and when cooked, rinse with cold water to stop the cooking and toss with 1 teaspoon sesame oil. 2) In a large skillet (cast iron or wok) over medium high heat, add neutral canola oil when hot. Add steak slices along with any extra juice from marinade. Cook for 3-4 minutes stirring regularly until steak is cooked through. 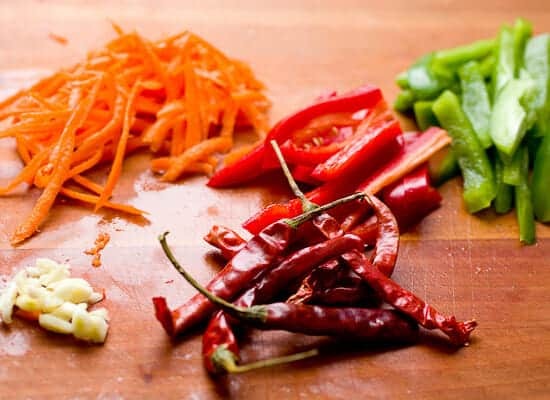 3) Add sliced garlic, peppers, carrots, and Arbol peppers (opt.) to the skillet along with all the sauce and cook for 2-3 minutes until sauce thickens and veggies soften a bit (they should still have some crispiness to them). 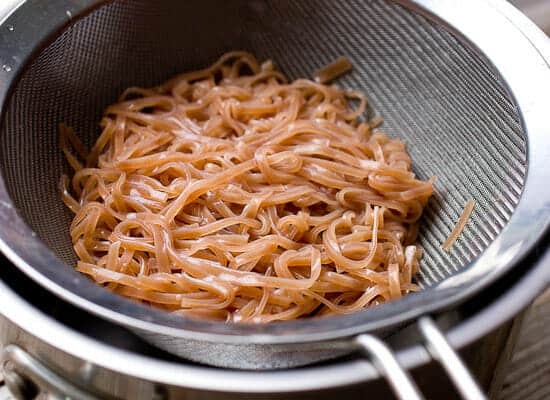 4) Toss in cooked noodles and stir to combine. 5) Divide noodles and beef between plates and garnish with fresh scallion. To start this dish, slice your steak (I like lean sirloin) into thin strips and toss it together with the simple marinade. A lot of the heat in this dish comes from the red pepper flakes in the marinade so if you want it less spicy, cut back on those. 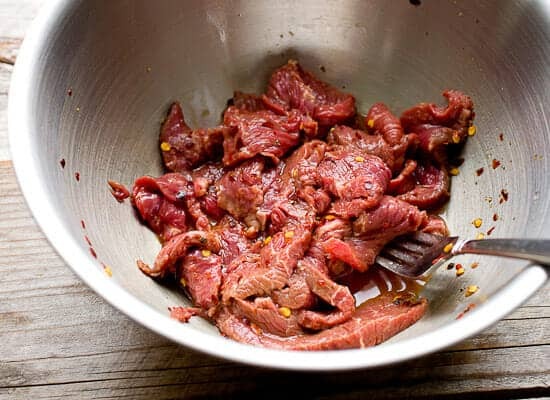 Marinate the beef while you prep the other ingredients. Once you start cooking, everything should be prepped because the recipe cooks very quickly. That means whisk together your sauce ingredients! And chop the peppers and garlic. I also tossed in some grated carrot and a few dried Arbol peppers for extra spiciness (again, optional). For the noodles you could use a bunch of different noodles. I used a new brown rice noodle I found. It was pretty good but I think I would just use a normal rice noodle next time. I thought these didn’t have quite the right texture. You could also use soba noodles or even just serve the stir-fry over rice. Assuming you use rice noodles, cook them according to package, drain them and rinse them with cold water to stop the cooking. Then toss them with a teaspoon of sesame oil to prevent them from sticking. This recipe cooks quickly once your stuff is prepped. It comes together all in one skillet or wok which is nice. Start your skillet over medium-high heat with a drizzle of oil. 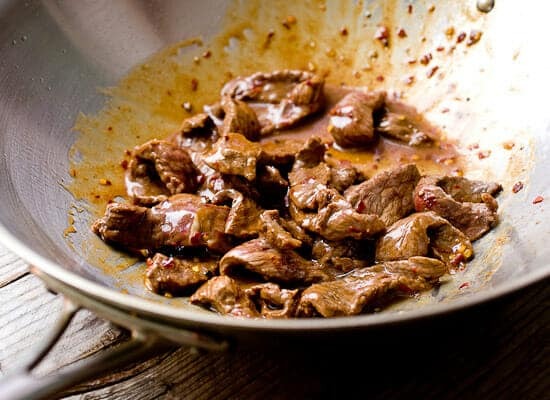 When the oil is glistening hot, add the sliced steak and marinade liquid. Cook for a few minutes until the beef is cooked. When beef is cooked, add the peppers, carrots, garlic, and dried peppers. Pour in sauce and toss everything together. The veggies should still have lots of crunch to them. Don’t overcook them. Cook that all for a minute or so until the sauce starts to thicken, then add the noodles! Toss this all together and it’s ready to go! It shouldn’t need any extra seasoning. Serve the noodle dish while everything is steaming hot with fresh scallions and any sauces you like on the side. I like even more chili garlic sauce on mine because I’m a crazy man. 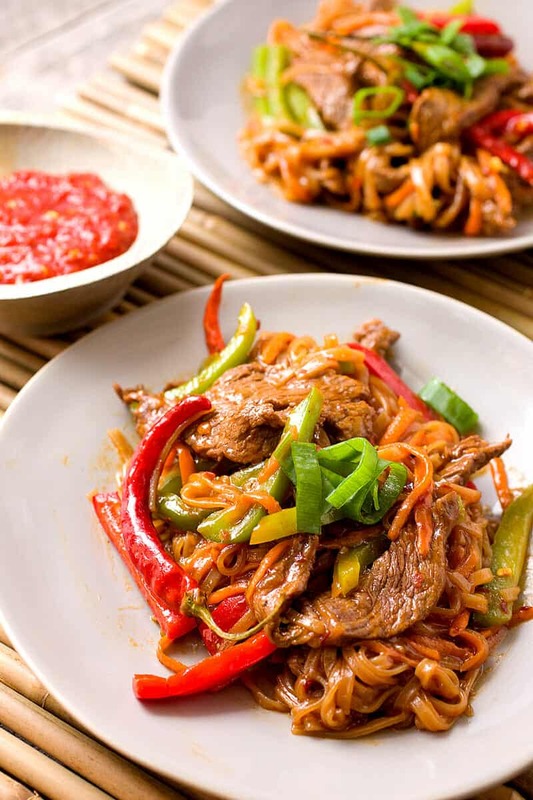 Whether it’s for a date night or actually just a quick weeknight meal, this Szechuan beef noodle dish should be on your list if you’re a fan of spicy food! Oh yum! I don’t mind having this on date night, especially when it comes to Szechuan spicy. Yum! 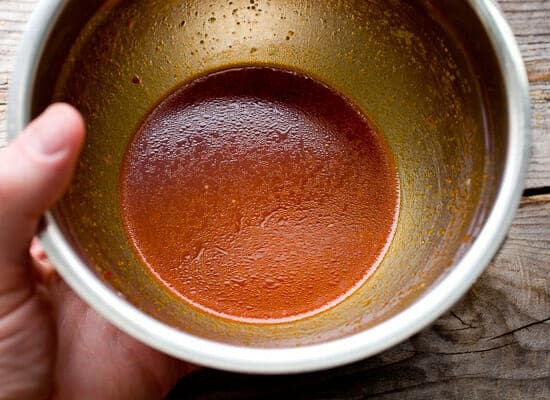 do you have your marinade recipe? It sounds delicious! Hey Marion! The recipe I used is listed in the recipe above. Hope that makes sense!